An artist's interpretation of a WhiteKnightTwo and its SpaceShipTwo launching on a Virgin Galactic flight to suborbital space. Thisstory was updated at 5:16 p.m. EST. NEW YORK - Future thrill-seekers will ride asleek spacecraft berthed under a massive, twin-boom mothership to the fringe ofspace in a design unveiled Wednesday by Virgin Galactic. The SpaceShipTwospacecraft and its WhiteKnightTwo carrier will begin initial tests thissummer to shakedown the novelspaceflight system designed by aerospace pioneer Burt Rutan and his firmScaled Composites. Based onRutan’s SpaceShipOne, a piloted and reusable spacecraft that won the$10 million Ansari X Prize for suborbital spaceflight in 2004, SpaceShipTwois an air-launched vehicle designed to carry six passengers and two pilots tosuborbital space and back. But unlikeSpaceShipOne, which launched from beneath its single-cabin WhiteKnight carrier,the new craft will drop from a twin-cabin high-altitude jet that can double asa space tourist training craft. 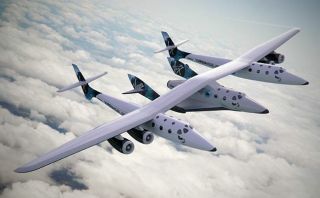 WhiteKnightTwo carries four engines and awingspan of about 140 feet (42 meters), rivaling a B-29 bomber, and is built tohandle unmanned rockets capable of launching small satellites into orbit,Virgin Galactic officials said. VirginGalactic is offering tickets aboard SpaceShipTwospaceliners for an initial price of about $200,000, though Branson said thecost is expected to drop after the first five years of operations. The spacetourism firm plans to eventual launch flights out of a terminal at New Mexico’s Spaceport America, with additional trips through the aurora borealis to bestaged from Kiruna, Sweden. To date,Virgin Galactic has about 200 assured passengers for future flights, $30million in deposits and about 85,000 registrations from customers interested inflying aboard SpaceShipTwo. Rutan,whose Mojave, Calif.-based Scaled has completed 60 percent of the firstSpaceShipTwo, said his firm is building at least five of the suborbitalvehicles - and two WhiteKnightTwo carriers - for Virgin Galactic. “This isnot a small program by any stretch of the imagination,” said Rutan, adding thathis firm hopes to build at least 40 SpaceShipTwos and 15 carrier craft over thenext 12 years. Eachspacecraft is designed to fly twice a day, with their WhiteKnightTwo carrierscapable of up to four daily launches, Rutan said. Over 12 years, more than100,000 people could fly to suborbital space aboard the vehicles, he added. VirginGalactic passengers like Beattie and others have already undergone centrifugetests to sample the experience launch and reentry, which can exert forces of upto six times the Earth’s gravity on the human body. WillWhitehorn, Virgin Galactic CEO, said each SpaceShipTwo passenger will beequipped with a pressure suit as a safety precaution, be free to move about a roomy cabinequivalent to a Gulfstream aircraft and peer at the Earth through wide, 18-inch(46-cm) windows during the several minutes of weightlessness offeredon each spaceflight. “Becauseclearly, if you’re going to go into space, you’re going to want to see theview,” Whitehorn said. SpaceShipTwo’scabin is much larger than the three-person capsule used on SpaceShipOne, andeach of the two WhiteKnightTwo carrier craft cabins are identical that of thespacecraft to make it a useful training tool, he said. Familymembers of passengers or other space tourists can watch a SpaceShipTwo launchfrom inside a WhiteKnightTwo cabin, each of which sits just 25 feet (7.6)meters from the center-mounted spaceship. While theinitial round of tests is slated for sometime this summer and the firstspaceflights pegged for 2009, Whitehorn stressed that safety is paramount. “We’re in arace with nobody, apart from a race with safety,” Whitehorn said. Rutan saidhe is targeting a safety factor akin to that of the earlier airliners of the1920s, which should still be 100 times better than the safety of today’s mannedspacecraft used by large governments today. “Don’tbelieve anyone who tells you that the safety level of new spacecraft is as safeas a modern airliner,” Rutan said. Thedevelopment and testing plan for SpaceShipTwo and its carrier craft has been slowedby an accidental fatal blast that killed three Scaled workers last July at theMojave Air and Space Port. Last week, California state occupation and safetyinspectors cited Scaled for failing to provide adequate training for workersand finedthe firm more than $25,000. Rutan saidhis firm has been working with state inspectors and officials to enhance workersafety, but the actual cause of the blast during a rocket oxidizer flow testwas still unknown. SpaceShipTwo’s rocket engine will not be finalized until thesource of the explosion is pinned down, he said. PatriciaGrace Smith, the FAA's associate administrator for commercial spacetransportation, lauded the commitment of Virgin Galactic and Scaled to safetyafter SpaceShipTwo’s unveiling.